This refreshing salad is made even more so with homemade yogurt-cucumber dressing. Preheat the grill to medium-high. Rub salmon with olive oil, and sprinkle with salt and pepper. Place on grill, skin side down, and grill 3-4 minutes, then flip and grill for an additional 3-4 minutes. Skin should peel away easily. Remove from heat and let cool. To make the dressing: In a small bowl, combine the cucumber, yogurt, lemon juice, spices, feta, and salt and pepper. Set aside. On each plate, distribute the mixed greens. Top with carrots, red cabbage, cherry tomatoes, corn, and olives. 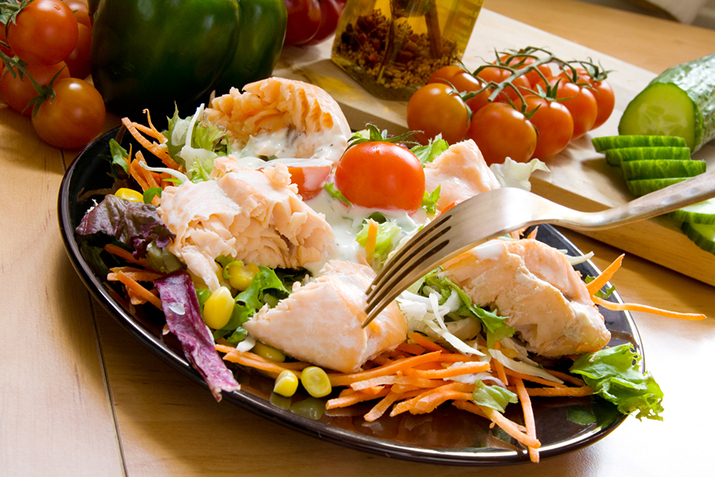 Place salmon on top of each salad. Spoon 2-3 tablespoons of dressing over each plate.